Case IH recently revealed that many Australian farmers have already adopted precision agriculture technology on their new equipment purchases, and those that have not say their dream tractor accessories are GPS and auto steer. New South Wales Case IH customer, Mark Bender and his parents, Keith and Lindy, have implemented precision ag technology and practices on their New South Wales wheat, barley and canola cropping enterprise. With Case IH equipment including a Steiger STX 450 tractor and Axial-Flow 2588 combine harvesters, the Benders also use the Case IH AFS Pro 600 display along with the AFS desktop software to manage their seeding, harvest and spatial data. The Benders also use a Case IH AccuSteer system combined with an real time kinematic (RTK) network to set up and maintain a controlled traffic environment with full stubble retention and inter-row sowing to retain more moisture and minimise unnecessary machine movements. They used the information collected by their Case IH 2588 combine’s inbuilt yield mapping capability to create prescription maps that would allow them to take advantage of variable rate seeding technology. With the near two-centimetre accuracy of the RTK system, the Benders have drastically reduced overlap and gaps, thus reducing input costs. On top of that, the Benders are enjoying the extra savings through variable rate application of fertilizer at seeding. These savings could mean the difference between that new machine or land purchase, or even the well-deserved holiday the Benders have been looking forward to. 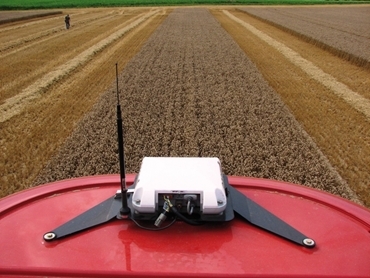 By following a few simple tips, farmers can reap a wide range of benefits from their precision agriculture technology. By simply taking advantage of the technology that comes standard with equipment, like yield mapping, farmers can reap a wide range of benefits from their precision agriculture technology. “Plan for your property’s unique needs by using yield maps to see how management techniques can be improved. Don’t be afraid to make changes based on the information from your precision agriculture technology – the savings could be significant. And start with the most advanced system you can afford to avoid the need to upgrade too soon. Remember, the initial set up costs will be repaid later in savings you make through reducing your input costs and labour or increasing your yields,” says Case IH Marketing Manager, Stuart Brown.